H. W. Ince was noted in The Times of December 8th 1915 as having been one of the 160 prisoners released from Ruhleben on the previous day who had travelled by train to Flushing ("Returning Civilians" p.9, col.F). Frank Ingham was recorded as a member of the Ruhleben Lancastrian Society in the Manchester Guardian of January 15th 1915 (p.12). The article is entitled "Interned in Germany: Lancashire's Civilian Prisoners: Full List of Those Detained at Ruhleben". His address was recorded as 76 Cannon Street, London, E. C.
J. Ingleby was noted in The Times of December 8th 1915 as having been one of the 160 prisoners released from Ruhleben on the previous day who had travelled by train to Flushing ("Returning Civilians" p.9, col.F). In Januray 2008 philatelist Andrew Brooks kindly contacted me to say that he had an envelope from a letter sent by Magnus Inkster, interned within Barrack 3 box 19 at Ruhleben. Information has reached Aberdeen that Mr John H. Irvin, trawl owner, is a prisoner in the internment camp at Ruhleben, Germany. Mr Irvin, it will be remembered, was one of the British passengers removed from the Dutch mail steamer Prins Hendrik, on its way from Rotterdam to England. No message from Mr Irvin has so far reached his relatives in Aberdeen. Mr Irvin is a member of the Scottish Fishery Board. The Scotsman of August 25th 1917 gives further details on Irvin, when giving the news that Irvin had been knighted for his war work. The article stated that Irvin was a member of the fish sales firm Richard Irvin & Son Ltd, based in Aberdeen. he was on the Scottish Fishery Board, and was advisor to the Board of Trde on fish and food supplies ("War Work Honours", p.9). Irvin was noted in The Times of November 9th 1931 as being present at a dinner meeting held in November 1931 by the Ruhleben Association, which was held to discuss an appeal to the House of Lords for the group's claims for compensation ("Reunion of Ex-Ruhleben Prisoners", p.17, col.D). Frederick Jabeson was one of sixteen men released from Ruhleben in January 1917, as reported in the Times of January 29th 1917 ("Changed Conditions in Germany", p.8, col. G). This Jackson is noted as being in Barrack 10 Box 5 on a postcard dated 6 MAR 1916, as held now by Dr. Manfred G. Heber of Grand Canaria (with thanks to Dr. Heber). A. Jackson, of Hull, was named in a list of merchant seamen interned at Ruhleben, as published by the Scotsman newspaper on 7/1/1915 (p.7). A. Jackson was the brother of William Jackson, and like him, was also a professional golfer interned in the camp. See below. From the handbook of the Ruhleben Football Association Season 1915, we learn that Alfred Jackson was resident at 3 Carlton Vale, Maida Vale, London W, was born in Golborne on 25 JUN 1887, was a music hall artist arrested in Frankfurt on 6 NOV 1914, and sent to Ruhleben, where he was interned in Barrack 1. Jackson was also recorded as a member of the Ruhleben Lancastrian Society in the Manchester Guardian of January 15th 1915 (p.12). The article is entitled "Interned in Germany: Lancashire's Civilian Prisoners: Full List of Those Detained at Ruhleben". His address was again recorded as 3 Carlton Vale, Maida Vale, London, N.W. William Jackson is listed in the surviving register from Barrack 5 at Ruhleben (register number 2), recorded by Neville Stanley Wilkinson in approximately 1916. In the register, Jackson is recorded as having been born on April 22nd 1888 in Newry, Ireland, and is described as having been a professional golfer prior to his internment. His home address was the School House, Langenhoe, Colchester. At the time the register was recorded, Jackson was noted as staying in Loft A.
Jackson is also recorded as having spent some time in the Lazarett between July 10th 1918 and July 11th. From the handbook of the Ruhleben Football Association Season 1915, Jackson is noted as being from the School House, Langenhoe, Colchester, and as having been born in Newry in 1888. He worked as a professional golfer in Cologne, where he was arrested on 5 SEP 1914. After a brief period held in Cologne he was sent to Ruhleben, where he was interned in Barrack 5. Jackson was one of the camp's Society of Irish Players, and the Times of January 8th 1917 complimented a play that he and fellow inmate Robert Maire Smyllie had co-written, entitled "The Night of the Wake", which was so successful that "it had to be repeated twice" (Irish Players at Ruhleben", p.11, col.F). Jackson was further noted as an inmate at Ruhleben by Francis Gribble, in his essay entitled "Leaves From a Ruhleben Notebook". "...in golf we were represented by Mr. Jackson and other professionals." William Jackson was a Golf professional at Cologne when he got arrested and sent to Ruhleben. Some sources indicate that Jackson was working at Cologne since 1909. An A.S Jackson was golf professional at Wiesbaden 1911 and 1912 and Bad Kissingen 1913. It is not known whether or not that Jackson was also interned at Ruhleben. William Jackson later worked as a professional at Chelmsford, England, from 1920 to 1922, whereas the A. Jackson from Wiesbaden worked at Church Stretton from 1920 to 1923. According to David Hamilton at St. Andrews, William's brother A. Jackson was indeed interned. Many thanks to both Christopher and David. He was also recorded as a member of the Ruhleben Lancastrian Society in the Manchester Guardian of January 15th 1915 (p.12). The article is entitled "Interned in Germany: Lancashire's Civilian Prisoners: Full List of Those Detained at Ruhleben". His address was recorded as 37 South Castle Street, Liverpool. The National Archives in London hold documents from 1916 at FO383/206 regarding a request from Mr. J Jacobs for permission to send shoe leather to his son in Ruhleben. From the handbook of the Ruhleben Football Association Season 1915, we learn that George Jacobsen was formerly resident at 13 Dartmouth park Avenue, London, N,W. Highgate. His year of birth is not given, nor his occupation. He was arrested in Lubeck on 6 NOV 1914 and then sent to Ruhleben, where he was interned in Barrack 6. Jacobsen was later in the Barrack 20 football team at Ruhleben, and according to issue six of the Ruhleben Camp Magazine (June 1917) played in the cup final in April 1917. The first leg was a scoreless draw, and in the rematch three days later, Barrack 20 won, 3-0. Samuel Jacobsohn was an inmate, as confirmed from a postcard he posted from the camp on June 12th 1917, which was placed on sale on E-Bay in August 2005, November 2005, and again in January 2006, addressed to Mrs Anna Jacobsohn, Bad-Nauheim, Burgaller 16. The card tells us that Jacobsohn was interned in Barrack 13. From Marcus Bateman's website, Samuel was released on March 6th 1918 to England, as noted in files at the National Archives in Kew under accession number MT9/1238. He was interned within Barrack 13. From the handbook of the Ruhleben Football Association Season 1915, Edward Jacquemain was noted as being from Frankfort, and as having been born in London in 1878. He worked as a clerk and was arrested in Frankfort. He was held in Frankfort and then Giessen before being sent to to Ruhleben, where he was interned in Barrack 7. H. James was recorded as a member of the Ruhleben Lancastrian Society in the Manchester Guardian of January 15th 1915 (p.12). The article is entitled "Interned in Germany: Lancashire's Civilian Prisoners: Full List of Those Detained at Ruhleben". His address was recorded as 27 Buchanan Road, Egremont, Cheshire. James Dyce Jamieson was born in Anstruther in 1886, and was named in a list of merchant seamen interned at Ruhleben, as published by the Scotsman newspaper on 7/1/1915 (p.7), in which he was referred to as 'of Leith'. He is also noted in Marcus Bateman's website as having been second officer on the 'Lothian', with is home address noted as 3 Trinity Crescent, Trinity. He produced a sketch for fellow inmate W. F. Pinn's autograph book, on November 27th 1916, a copy of which was supplied by Paul Bayliss, current owner, in July 2006, and to whom I am very grateful. Many thanks also to James' great nephew Alex Muir for his corrections to this entry in July 2009, much appreciated! Alex has also informed me that James eventually left Ruhleben and continued in the merchant service, eventually passing away out in the Middle East, where he was subsequently buried. Edward William Jeaffreson is listed in the surviving register from Barrack 5 at Ruhleben (register number 2), recorded by Neville Stanley Wilkinson in approximately 1916. In the register, Jeaffreson is recorded as having been born on March 16th 1870 in Framlingham, and is described as having been a teacher prior to his internment. His home address was listed as Framlingham. At the time the register was recorded, Jeaffreson was noted as staying in loft B. He is further noted as having set off for England on January 2nd 1918. S. E. Jefferson was thanked for articles written for the Ruhleben Camp Magazine by its editor, C. G. Pemberton, in the fifth issue (Christmas 1916, p.62). Jenkins was noted in the second issue of In Ruhleben Camp (1915, p.22) as being on the winning Welsh side against the Scots-Colonial team, in a friendly rugby international at the camp. D. Jenkins was recorded as a member of the Ruhleben Lancastrian Society in the Manchester Guardian of January 15th 1915 (p.12). The article is entitled "Interned in Germany: Lancashire's Civilian Prisoners: Full List of Those Detained at Ruhleben". His address was recorded as c/o S. C. Johnson, 48 Demesne Road, Alexandra Park, M/c. From the handbook of the Ruhleben Football Association Season 1915, Herbert Jenkinson is noted as being a cotton mill manager from 18 Southfield Street, Bolton. He was arrested in Luneburg on 11 AUG 1914 and sent to Ruhleben, where he was interned in Barrack 6. Jenkinson was also recorded as a member of the Ruhleben Lancastrian Society in the Manchester Guardian of January 15th 1915 (p.12). The article is entitled "Interned in Germany: Lancashire's Civilian Prisoners: Full List of Those Detained at Ruhleben". His address was recorded as 18 Southfields Street, Lever, Bolton. H. Jenkinson was noted in The Times of December 8th 1915 as having been one of the 160 prisoners released from Ruhleben on the previous day who had travelled by train to Flushing ("Returning Civilians" p.9, col.F). F. Jepson was thanked for his illustrations for the Ruhleben Camp Magazine by its editor, C. G. Pemberton, in the fifth issue (Christmas 1916, p.62). K. Johanssen is noted on a list of prisoners of war on a document entitled 'Men in Englander Lager, Ruhleben', held by Hull Local Studies Library (provisional catalogue entry: Hohenrein Collection F 10b), supplied by senior local studies librarian David Alexander Smith in July 2008, for which I am grateful. The document notes that Johanssen was a merchant seaman on board the Coralie Horlock, and interned in Barrack 13. The National Archives in London hold documents from 1916 at FO383/208 regarding a request from Christian John for financial assistance following a period of internment at Ruhleben Camp. W. John is noted on a list of prisoners of war on a document entitled 'Men in Englander Lager, Ruhleben', held by Hull Local Studies Library (provisional catalogue entry: Hohenrein Collection F 10b), supplied by senior local studies librarian David Alexander Smith in July 2008, for which I am grateful. The document notes that John was interned in Barrack 9. A gent called Johnson is listed in the second issue of In Ruhleben Camp (June 1915, p.19) as being a member of the Ruhleben Dramatic Society. Another Johnson was noted in the football section of the fifth issue of the Ruhleben Camp Magazine (Christmas 1916, p.58) as being a member of Barrack 22. Abraham Johnson was one of eight men released from Ruhleben in September 1916, as reported in the Times of September 8th 1916 ("Returned Prisoners' Stories", p.5, col. D). The article quotes Johnson as saying that he had been ill for ten weeks, and had spent that time in Lazaret. Andrew Johnson was listed in The Times of January 8th 1916 ("Released Civilians" p.5, col. D) as one of 69 men released from Ruhleben on Thursday, January 6th, 1916, who subsequently travelled to Flushing for their return trip to England. E. J. Johnson was thanked for his illustrations for the Ruhleben Camp Magazine by its editor, C. G. Pemberton, in the fifth issue (Christmas 1916, p.62). E. L. Johnson is noted on a list of prisoners of war on a document entitled 'Men in Englander Lager, Ruhleben', held by Hull Local Studies Library (provisional catalogue entry: Hohenrein Collection F 10b), supplied by senior local studies librarian David Alexander Smith in July 2008, for which I am grateful. The document notes that Johnson was a merchant seaman on board the Coralie Horlock, and interned in Barrack 22, A.
Eric M. Johnson was recorded as a member of the Ruhleben Lancastrian Society in the Manchester Guardian of January 15th 1915 (p.12). The article is entitled "Interned in Germany: Lancashire's Civilian Prisoners: Full List of Those Detained at Ruhleben". His address was recorded as 48 Demnesne Road, Alexandra Park, M/c. This may be the Eric Johnston named in an undated Foreign Office document contained within file FO 369/710, entitled Russenlager Ruhleben (Ruhleben Russian Camp), implying it was compiled at the outbreak of internment in 1914. He was described as a 23 year old engineer previously at work in Berlin. This is almost certainly the same Johnston listed as being at Ruhleben in another document in FO 369/710 dated 11 OCT 1914. The name was included in a list communicated to the Foreign Office by a Nurse Coe (with thanks to Simon Fowler). This Eric Johnson is also noted in a document in FO 369/710 as a 22 year old English born engineer sent first to Berlin's Stadtvogtei on 29 AUG 1914 and then to Ruhleben on 9 SEP 1914. He had been residing at 35 Rankestrasse in Berlin. The information was originally compiled by the American Embassy in Berlin. F. V. Johnson is recorded in the fourth issue of the magazine (August 1916, p.38) with an average cricket score of 42.85 runs per inning, having scored 300 runs in total for 8 innings in several July matches, once not out. George Johnson is listed in the surviving register from Barrack 5 at Ruhleben (register number 2), recorded by Neville Stanley Wilkinson in approximately 1916. In the register, Johnson is recorded as having been born on June 4th 1885 in Hoppegarten, and is described as having been a merchant prior to his internment. His home address was listed as c/o Mrs. P. Tebb, 4 Ross Memorial, Newmarket. At the time the register was recorded, Johnson was noted as staying in box 22, having transferred there from the Tea House on April 22nd 1916. Between October 12th 1917 and October 18th, Johnson spent some time being treated at the Schonungsbaracke. He is also recorded as having spent some time in the Schonungsbaracke between September 2nd 1918 and September 7th. H. E. Johnson is noted on a list of prisoners of war on a document entitled 'Men in Englander Lager, Ruhleben', held by Hull Local Studies Library (provisional catalogue entry: Hohenrein Collection F 10b), supplied by senior local studies librarian David Alexander Smith in July 2008, for which I am grateful. The document notes that Johnson was a merchant seaman on board the S. S. Hull, and interned in Barrack 3, box 24. This Jones was noted as a linesman in a mock international between England, led by Bloomer, and the Rest of the World, led by Cameron, on May 2nd 1915. Kick off took place at 4.30pm, and a document with the teams listed was recently discovered amongst some Foreign Office files by the National Archives, in November 2005. The National Archives holds documents from 1916 at FO383/207 regarding the repatriation of Mr. Albert H. Jones to New Zealand on health grounds from Ruhleben. The performance was repeated on April 23rd, 24th and 25th, 1916, as noted in the Scotsman newspaper of May 15th 1916 ("Shakespeare Celebrations in Ruhleben", p.7). In issue six of the Ruhleben Camp Magazine (June 1917) Duncan Jones is further noted as having produced the plays "The School for Scandal" and "Good Friday" whilst in the camp. The Liddle Collection at Leeds University holds an extract 'An Alabaster Image of St. Christopher', with reference to CD Jones who was at Ruhleben, from 'Country Life' magazine, dated December 31st 1921; the item is held under RUH 43, a collection of items relating to fellow prisoner Wyatt T. R. Rawson. Jones was recorded as a member of the Ruhleben Lancastrian Society in the Manchester Guardian of January 15th 1915 (p.12). The article is entitled "Interned in Germany: Lancashire's Civilian Prisoners: Full List of Those Detained at Ruhleben". His address was recorded as 104 Chorley New Road, Bolton. From the handbook of the Ruhleben Football Association Season 1915, we learn that David William Jones was from 26 Minster Road, Cricklewood, and was born in London in 1885. He was a civil servant, and was arrested in Wesel a. Rhine on 11 AUG 1914, and after a brief period of imprisonment in Sennelager and Giessen, he was sent to Ruhleben, where he was interned in Barrack 4. The Liddle Collection of Leeds University holds various items relating to the stay at Ruhleben of Douglas D. Jones, under reference RUH 27, which he donated to the collection in September 1977. 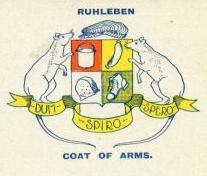 These include an edition of 'The Ruhleben Daily News' dated August 25th 1917; a German press cutting; a prospectus of work for the summer term at Ruhleben Camp School from 1917; a postcard in French dated December 21st 1917; a hand-painted Christmas card from 1918; a note from T.H.M. 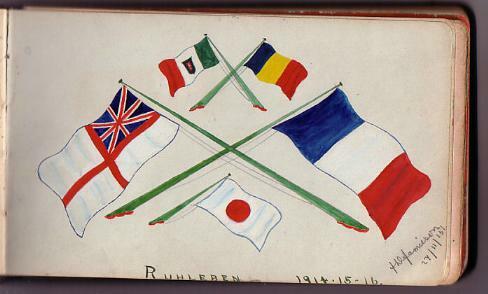 ; a manuscript journal from November 1917; fragments of a manuscript verse; 20 chalk drawings, sketches, watercolours and oil paintings from between 1917 and 1918; two photographs; bound issues of 'In Ruhleben Camp' (June to October 1915) and 'The Ruhleben Camp Magazine' (March to May 1916); a hand-painted illustrated book 'An Anthology of English Verse' from 1918; a manuscript diary; and a typed transcript of an interview recorded with Peter Liddle in September 1977, with the original audio held on tapes 470 and 484. The online index also tells us Jones was born in 1886 in Colchester and educated at Pembroke College, Cambridge. After becoming a solicitor, he was visiting clients near Gotha at the outbreak of the war, and whilst interned at Ruhleben between 1914 and 1918 he lived in Barrack 11. Francis Jones is listed in the surviving register from Barrack 5 at Ruhleben (register number 2), recorded by Neville Stanley Wilkinson in approximately 1916. In the register, Jones is recorded as having been born on August 16th 1874 in Wolverhampton, and is described as having been a silver polisher prior to his internment. His home address was listed as Brussels. At the time the register was recorded, Jeaffreson was noted as staying in box 17, having been placed there upon his arrival from Belgium on February 8th 1916. He later departed for Holland on March 22nd 1918. Heinrich Alfred Jones is listed in the surviving register from Barrack 5 at Ruhleben (register number 2), recorded by Neville Stanley Wilkinson in approximately 1916. In the register, Jones is recorded as having been born on April 16th 1882 in Hamburg, and is described as having been a merchant prior to his internment. His home address was listed as Eppendorferlandstr. 48 I, Hamburg. At the time the register was recorded, Jones was noted as staying in box 21, having arrived there from the Tea House on April 19th 1915. Herbert Jones was recorded as a member of the Ruhleben Lancastrian Society in the Manchester Guardian of January 15th 1915 (p.12). The article is entitled "Interned in Germany: Lancashire's Civilian Prisoners: Full List of Those Detained at Ruhleben". His address was recorded as 20 Sandown Road, Seaforth, Liverpool. Cardiff man Herbert Arnold Jones, chief officer of the steamer Dartwen, owned by Messrs. W. & C. T. Jones of Cardiff, was released from Ruhleben in January 1917, arriving back at Gravesend on January 27th 1917, as noted in the Scotsman newspaper of February 2nd 1917 ("Mercantile Marine Officers Back From Ruhleben", p.3). Jones was one of sixteen men released from Ruhleben in January 1917, as reported in the Times of January 29th 1917 ("Changed Conditions in Germany", p.8, col. G). H. S. Jones was recorded as a member of the Ruhleben Lancastrian Society in the Manchester Guardian of January 15th 1915 (p.12). The article is entitled "Interned in Germany: Lancashire's Civilian Prisoners: Full List of Those Detained at Ruhleben". His address was recorded as 14 Burns Street, Bootle. John Henry Jones is listed in the surviving register from Barrack 5 at Ruhleben (register number 2), recorded by Neville Stanley Wilkinson in approximately 1916. In the register, Jones is recorded as having been born on September 19th 1866 in Pensarne, North Wales, and is described as having been a mariner on the "Victorian Transport" prior to his internment. His home address was listed as 80 Haldane Road, East Ham, London. At the time the register was recorded, Jones was noted as staying in loft A, having transferred there from Barrack 1 on May 20th 1915. On May 10th 1918, Jones transferred again to Barrack 7. J. H. Jones made quite an interesting little speech on the Arbitration and Conciliation Act of New Zealand but did not commit himself to either side. J. P. Jones was appointed to chair the camp's Finance Department in March 1915, as recorded in the Scotsman on 29/3/1915 (p.8) and the Times on 29/3/1915 ("More and Better Food at Ruhleben" p.4 col A). The department's remit was to control and administer all camp funds and distribution of monetary relief. In an article in the Scotsman newspaper of October 27th 1915, Jones was listed as the camp treasurer ("Ruhleben Camp - Success of Civil Administration", p.9). The second issue of In Ruhleben Camp (June 1915) ran an article entitled "How the Camp Spends its Money - Interview with Camp Treasurer" (p.3), a spoof interview with Jones in his capacity as camp treasurer. In the seventh issue (Sep 1915, p.43), Jones co-authored a letter on the Finance Committee Report. He was again noted as the Camp Treasurer, and as a member of the committee. The National Archives in London hold documents at FO383/191 from 1916, concerning Percy Darwent Jones, a British subject interned at Ruhleben, on the payment of his rent arrears in Darmstadt. Jones was recorded as a member of the Ruhleben Lancastrian Society in the Manchester Guardian of January 15th 1915 (p.12). The article is entitled "Interned in Germany: Lancashire's Civilian Prisoners: Full List of Those Detained at Ruhleben". His address was recorded as 2 Catherine Street, Litherland, Liverpool. W. H. Jones was a British horse trainer working in Hoppegarten, who was interned in Ruhleben at the beginning of November 1914, as noted in the Scotsman newspaper on 9/11/1914 (p.9), and in The Times of the same day ("British Interned in Germany", p. 7, col. E). W.H. Jones held trainer button # 92. He was released and was listed as a trainer under special conditions in 1916. As a jockey he had previously won 4 classic races in Germany. He stayed in Germany after the war as trainer. He was probably born near Hoppegarten. W. Neale Jones was chief officer on the Winterton, and at his arrest was noted as being from 64 Parliament Road, Middlesborough, and born in 1862. He was named in a list of merchant seamen interned at Ruhleben, as published by the Scotsman newspaper on 7/1/1915 (p.7). Jones was recorded as a member of the Ruhleben Lancastrian Society in the Manchester Guardian of January 15th 1915 (p.12). The article is entitled "Interned in Germany: Lancashire's Civilian Prisoners: Full List of Those Detained at Ruhleben". His address was recorded differently in this, as being 8 Moville Street, Park Road, Liverpool. Francis Edward Jordan is listed in the surviving register from Barrack 5 at Ruhleben (register number 2), recorded by Neville Stanley Wilkinson in approximately 1916. In the register, Jordan is recorded as having been born on May 11th 1891 in London, and is described as having been a clerk prior to his internment. His home address was listed as Wildenbruchstr. 60 II, Dusseldorf-Oberkassel. At the time the register was recorded, Jeaffreson was noted as staying in Box 5. From the handbook of the Ruhleben Football Association Season 1915, Jordan is noted as being from Dusseldorf-Obercapsel, and as having been born in London in 1891. He worked as a correspondent in Dusseldorf, where he was arrested on 28 AUG 1914. After a brief period held in Dusseldorf and Duisburg, he was sent to Ruhleben, where he was interned in Barrack 5. W. Jordan is noted on a list of prisoners of war on a document entitled 'Men in Englander Lager, Ruhleben', held by Hull Local Studies Library (provisional catalogue entry: Hohenrein Collection F 10b), supplied by senior local studies librarian David Alexander Smith in July 2008, for which I am grateful. The document notes that Jordan was a merchant seaman on board the S. S. Hull, and interned in Barrack 22. H. Joseph was noted in The Times of December 8th 1915 as having been one of the 160 prisoners released from Ruhleben on the previous day who had travelled by train to Flushing ("Returning Civilians" p.9, col.F). J M C Josephson has opened a carpentry workshop: first shed opposite Barrack 5. All work done at lowest prices! He knows how to make Ruhleben lodgings cosy, comfortable and healthy. Do you need a bedstead. Go to him at once. Joseph Marcus C. Josephson was noted as having returned from Kriegsgefangenenlazt to Barrack 13 on March 5th 1918, and then as one of a group of Ruhleben inmates released on March 6th 1918 to England, in a file held at the National Archives in Kew under accession number MT9/1238. (Many thanks to Marcus Bateman for the information in this last paragraph). C. A. Jung is noted as having been in the Teahouse on a letter dated 22 DEC 1915, held by Dr. Manfred G. Heber of Grand Canaria (with thanks to Dr. Heber). Nico Jungmann was listed as one of the former inmates at Ruhleben in an article in The Times on January 4th 1919 concerning the Ruhleben Exhibition at the Central Hall of Westminster ("Life in Ruhleben", p.11, col. F). Jungmann was listed as having assisted with the construction of a model horsebox on display at the exhibition. Jungmann was also recorded at the Ruhleben Exhibition on the day that the Crown Princess of Sweden visited. The article appeared on January 30th 1919 in the Times ("Ruhleben Exhibition", p.11, col. F). The Times of February 5th 1919 also tells us that the princess returned on February 4th to the exhibition, and purchased 40 paintings, with the painters selected including Jungmann ("Court News", p.11, col. B). H. Jurgenson was noted in The Times of December 8th 1915 as having been one of the 160 prisoners released from Ruhleben on the previous day who had travelled by train to Flushing ("Returning Civilians" p.9, col.F).